Life of a Catholic Librarian: Need a quick gift for someone receiving a sacrament in May? Need a quick gift for someone receiving a sacrament in May? I just love this time of year, don't you? Springtime, new beginnings, Easter...and sacraments of initiation coming up in May. Last year, I just reveled in Henry making his First Communion, I enjoyed that so thoroughly. This year, we don't know anyone receiving a sacrament, and it'll be quite a while until Henry reaches Confirmation age (at least the way they do it in our diocese) or for Anne to receive First Reconciliation, so I'm living vicariously through others. :) I *am* however, on the prowl for birthday gifts for Anne, whose birthday is May 18th, so I was looking and had a few ideas that will work for those needing a gift for First Communion or Confirmation. Saintly Silver on Etsy, whom I've mentioned before *heart* has a section of Quick Ships of already assembled dolls, ideal for anyone needing one in early May. She's got 32 dolls listed in the Quick Ship section right now, which is pretty awesome. They usually are on a 6 week schedule to ship, since her order queue is so long and her shop so popular. But she prepares ahead for her rush periods, of which the May sacraments are one. She has boy and girl First Communion dolls (like the one pictured above), with the Anima Christi prayer on the back and a "In Honor of your First Holy Communion" notation. She also has angels, St. Patrick, Mary, and the Holy Family ready for immediate shipment. 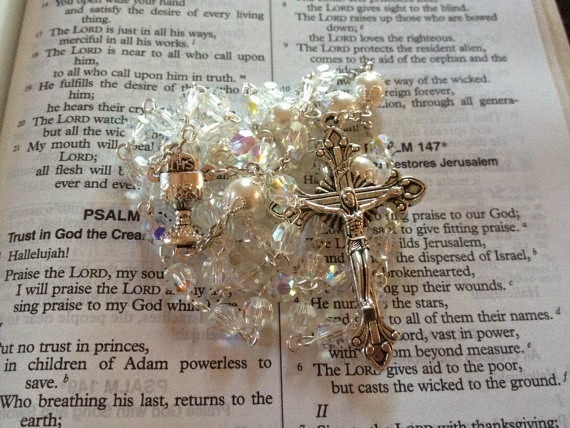 Allison also has her rosary shop stocked with rosaries, most of which are ready to ship (just make sure to check for the "Made to Order" indication and avoid those if your deadline is pretty tight). This one in particular is ideal for First Communion, no? I love the chalice center. But she has a ton of in-stock selection, all beautiful! I like the availability and selection given that First Communions are a mere 4 weeks away. 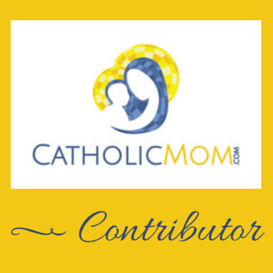 Do you know anyone receiving First Communion or Confirmation this year? 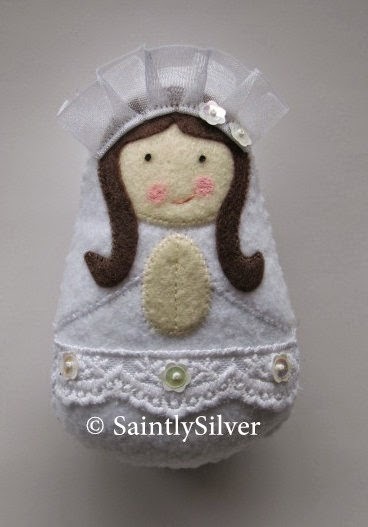 I love those Saintly Silver felt dolls! We got them for our granddaughters last Christmas--three saint dolls, for the three wonderful saints after whom they were named. They are just so beautifully made! One of my most prized First Communion gifts is a rosary my great-aunt (an IHM sister) gave me. I still have it and use it! That's a great idea. I think I understand Anne way more now because she has the same b-day as my sister! What are the odds?